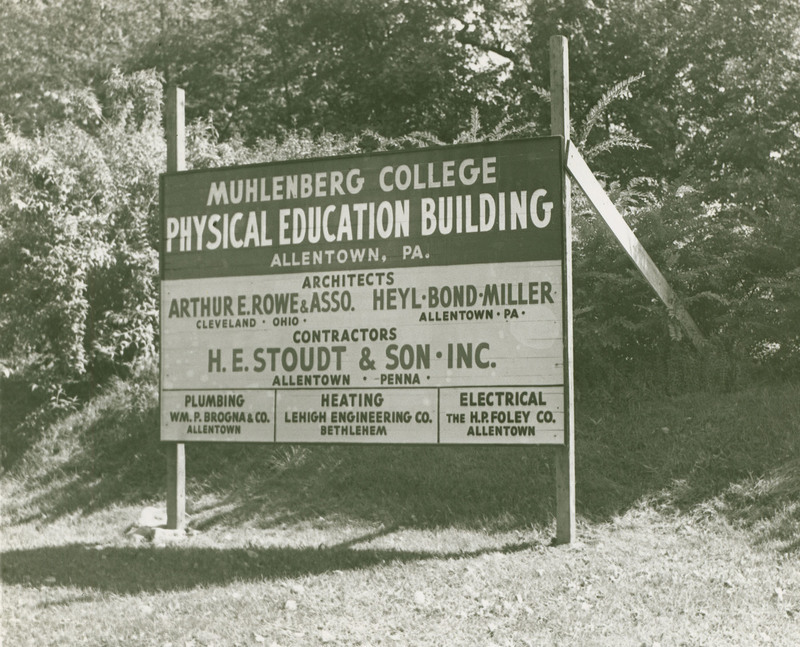 On June 6, 1953, the cornerstone was laid for Muhlenberg’s long-awaited gymnasium. Conceived as one of the three essential buildings for “A Greater Muhlenberg” in the early 1920s (along with a sciences building and a library), this part of the plan took thirty years to come to fruition. 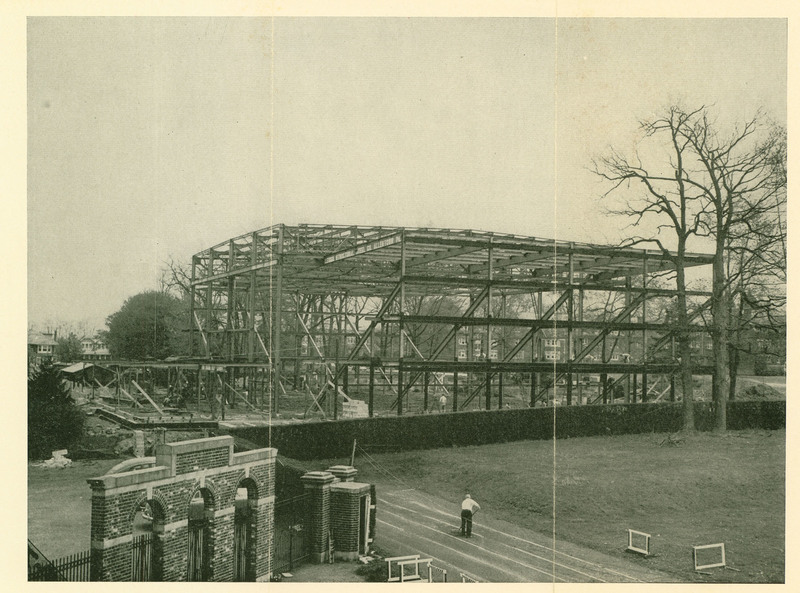 The construction was approved by the Board of Trustees in 1940, with the goal of having an athletics facility complete in time for the College's centennial. 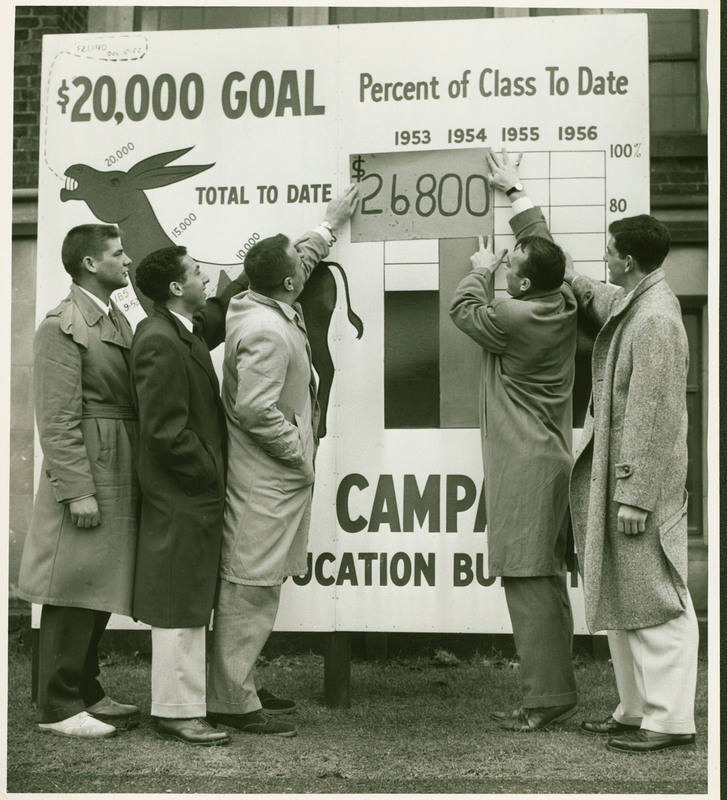 Muhlenberg students and alumni remained supportive throughout; letters from alumni serving in World War II reference small contributions from their pay to the building fund for “the field house.” However, it was a comprehensive Development Plan put forward in the early 1950s that finally provided the resources and opportunity to break ground. 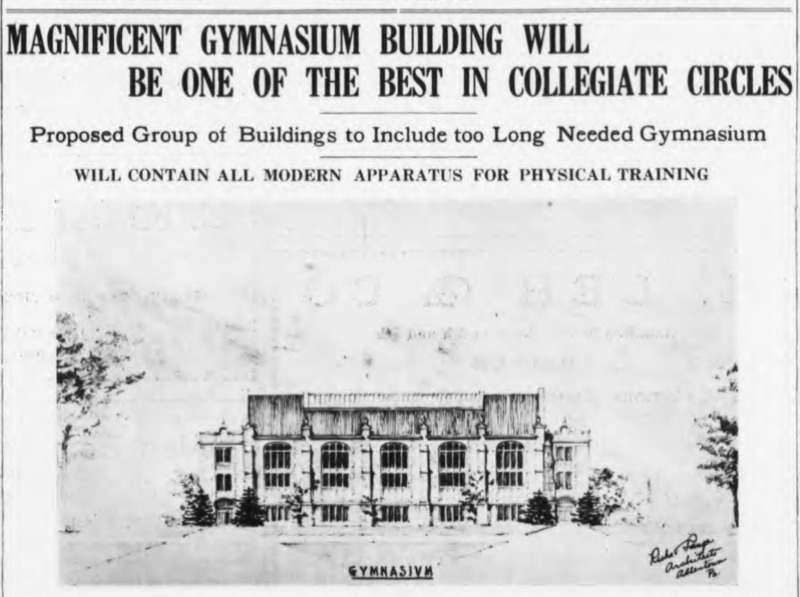 Prior to Memorial Hall’s construction, athletic facilities were confined to a small gymnasium in the basement of West Hall (now Brown) and a physical education space in the basement of the Administration Building (Ettinger). Basketball games were played at nearby high schools. 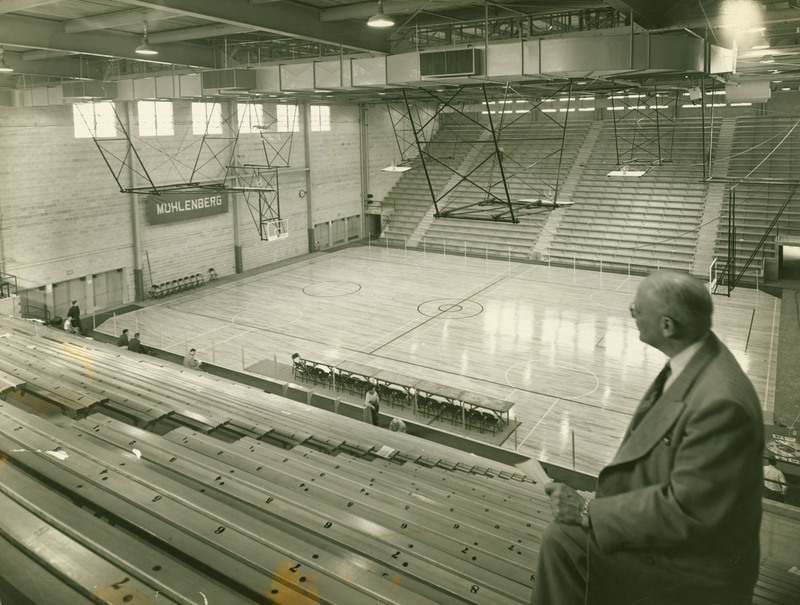 Designed by Arthur E. Rowe, Associates of Cleveland, OH, and supervised by architects Heyl, Bond, and Miller of Allentown, the field house was to have a basketball court that could seat 4,200 spectators, and which could be converted into an auditorium that would seat 6,000. At the time, this was the largest indoor assembly location in Allentown. 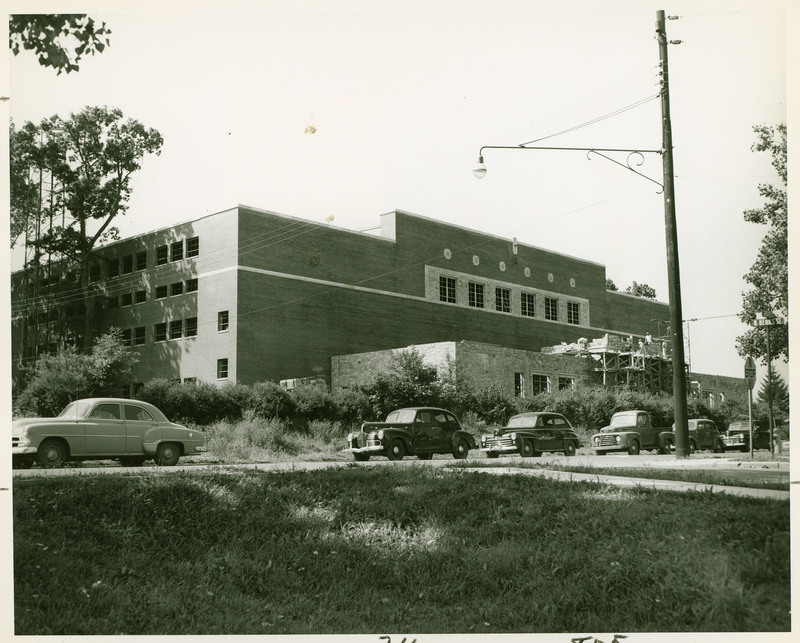 Additionally, there were to be twenty rooms that included offices for physical education staff, lockers, training rooms, a laundry, and a room for the Varsity “M” Club. The exterior was comprised of limestone, local Blue Mountain stone, and brick facing. 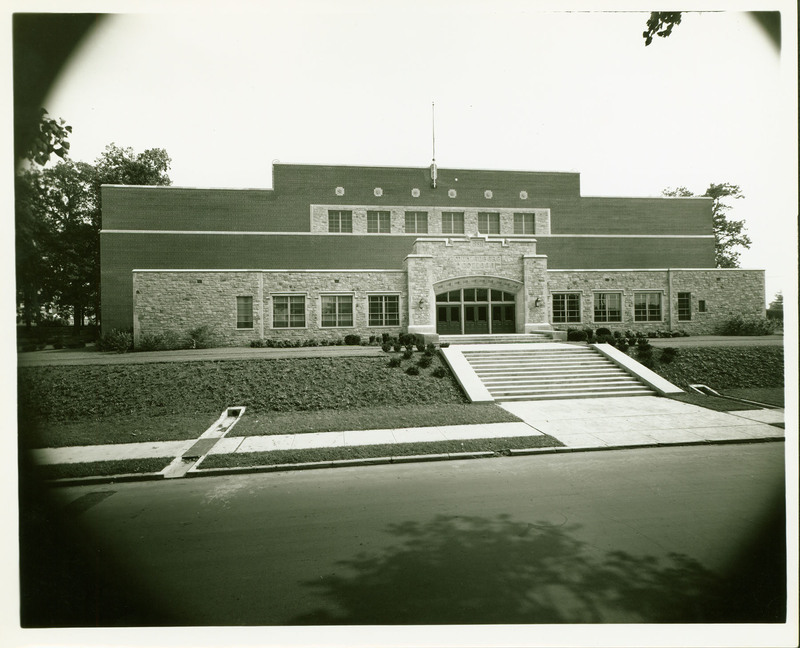 “Memorial Hall” was dedicated on February 6, 1954, and the inaugural basketball game against Gettysburg took place the same evening, followed by a dance on the court. A bronze plaque commemorating the Muhlenberg men who had sacrificed their lives in service in World War I, World War II, and Korea was unveiled, and it can still be seen inside the Liberty Street entrance today. For several years in the mid-1950s, Memorial Hall was the site of the “Ice Vogues,” a touring ice-skating performance that was sponsored by the Muhlenberg Women’s Auxiliary. Through the decades, Memorial Hall has hosted speeches by notables from Muhammed Ali to Barack Obama; performances from the Beach Boys to Billy Joel. In 1981-82, Muhlenberg’s athletic facilities were enlarged with the addition of the three-wing Life Sports Center. On May 21, 1982, at the completion of the swimming pool wing, the 1953 cornerstone was reset and rededicated. Additionally that year, the display case showcasing Muhlenberg athletic memorabilia near the Liberty Street entrance was added, thanks to contributions largely from alumni athletes. Essentially, Memorial Hall remains unchanged as it approaches its seventh decade. 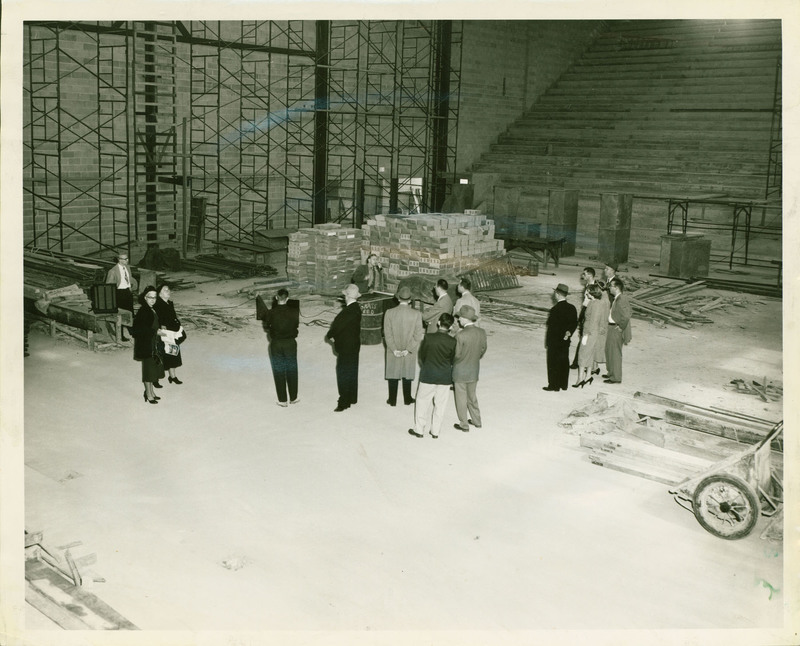 Special Collections and Archives, Trexler Library, Muhlenberg College, “Memorial Hall (1953),” Muhlenberg Pathways to Present, accessed April 23, 2019, http://pathways.trexlerworks.muhlenberg.edu/items/show/35. Published on Sep 17, 2018. Last updated on Sep 21, 2018.